In the contemporary world, the role of the commercial composer has grown to include a wide range of new responsibilities. Modern composers not only write music, but also often need to perform, record, and market their own works. The Craft of Contemporary Commercial Music prepares today’s music students for their careers by teaching them to compose their own music, produce it professionally, and sell it successfully. The textbook assumes no prior knowledge of music theory or audio topics, and its modular organization allows instructors to use the book flexibly. Exercises at the end of each chapter provide practice with key skills, and a companion website supports the book with video walkthroughs, streaming audio, a glossary, and printable exercise pages. 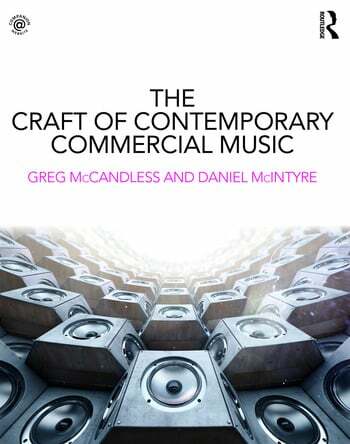 Combining a grounding in music notation and theory concepts with a foundation in essential technologies, The Craft of Contemporary Commercial Music offers an innovative approach that addresses the needs of students preparing for music careers. Greg McCandless is Assistant Professor of Music Theory at Appalachian State University. Daniel McIntyre is Department Chair of Music Composition at Full Sail University.